The Cosserat theory of elasticity, also known as micropolar elasticity, the micropolar theory of elasticity, or micropolar continuum mechanics, incorporates a local rotation of points as well as the translation assumed in classical elasticity; and a couple stress (a torque per unit area) as well as the force stress (force per unit area). The force stress is referred to simply as 'stress' in classical elasticity in which there is no other kind of stress. The idea of a couple stress can be traced to Voigt during the early development of the theory of elasticity. More recently, theories incorporating couple stresses were developed using the full capabilities of modern continuum mechanics. Early theoretical work was done by the Cosserat brothers, by Mindlin, and by Nowacki. Eringen incorporated micro-inertia (which allows incorporation of dynamic effects) and renamed Cosserat elasticity micropolar elasticity. Generalized continuum theories such as Cosserat elasticity are pertinent to the performance of materials because a reduction in stress concentration factor around holes and cracks is predicted. This can give rise to improved toughness. In the following, we present experimental results for materials with microstructure. In the isotropic Cosserat solid or micropolar continuum, there are six elastic constants, in contrast to the classical elastic solid in which there are two, and the uniconstant material in which there is one. Cosserat elasticity may be viewed as a particular manifestation of nonlocality, but is not equivalent to the general nonlocal elasticity. Strain gradient effects occur. Cosserat elasticity is more general than the gradient plasticity theory paradigm used to model size effects in plasticity. In multiscale modeling, Cosserat effects are expected to appear as the consequence of the largest structural elements in the material. Multiscale modeling does not, however, allow prediction of Cosserat effects in complex composites such as those of biological origin because the properties of all constituents are not well characterized. Cosserat elasticity entails sensitivity to strain gradient. New phenomena are predicted that are not anticipated in strain gradient models. Experiment is especially called for in such cases. In Cosserat elasticity, elastic constants obtained in different experimental modalities have been compared successfully for internal consistency. Research, mostly experimental, is presented below in aspects of composite materials, micromechanics, cellular solids, and biological materials which can be understood via Cosserat (or micropolar) elasticity. We experimentally determine the Cosserat elastic constants, and demonstrate the predictive power of Cosserat elasticity in correctly predicting strain distribution using elastic constants determined by the method of size effects as shown in the diagram below. Selected materials with microstructure are shown experimentally to obey micropolar theory rather than classical elasticity. Micropolar elastic constants are determined via experiments. If desired these may be converted into bending and curvature moduli associated with the Mindlin couple stress theory which is a special case of Cosserat elasticity. Get pdf of a review article. Lakes, R. S., "Experimental methods for study of Cosserat elastic solids and other generalized continua", in Continuum models for materials with micro-structure, ed. H. Muhlhaus, J. Wiley, N. Y. Ch. 1, p. 1-22, (1995). Material constants of micropolar materials or Cosserat elastic solids are determined via experiment. This diagram shows the distribution of strain measured in the torsion of a prismatic specimen of bone, of square cross section. Shown for comparison is the theoretical strain distribution according to classical elasticity. That strain vanishes at the corner of the cross section. Also shown is the theoretical strain distribution according to Cosserat elasticity. 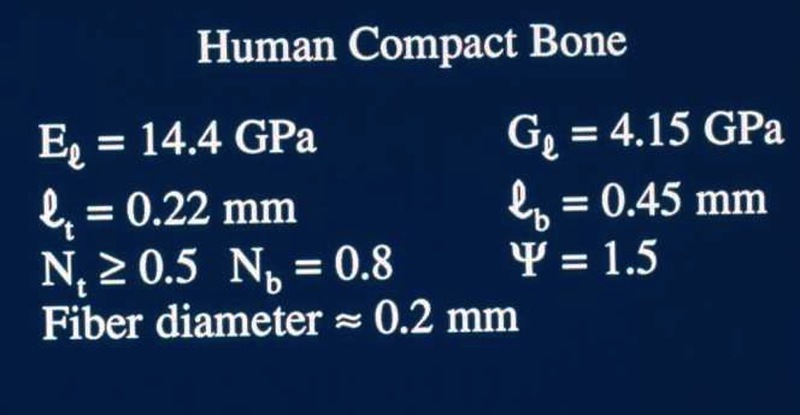 The elastic constants used for the calculation were determined in independent measurements of size effects on wet bone. The predictive power of Cosserat elasticity is illustrated. Wet bone follows the Cosserat curve. Strain is redistributed from peak regions to regions which are classically forbidden so that stress concentration is ameliorated for bone. Cosserat equations using symbols after Eringen. Click on image for larger image. Here is a table of symbols used by different authors. Couple stress theory is a special case for κ tending to infinity, much larger than the shear modulus. Classical elasticity is, according to its name, the currently accepted theory of elasticity. The following behavior is predicted. (i) The rigidity of circular cylindrical bars of diameter d in tension is proportional to the square of the diameter; in bending and torsion, the rigidity is proportional to the fourth power of the diameter. (ii) The wave speed of plane shear waves and dilatational waves in an unbounded medium is independent of frequency. (iii) There is no length scale in classical elasticity, hence stress concentration factors for holes or inclusions in an infinite domain under a uniform stress field depend only on the shape of the inhomogeneity, not on its size. (i) A size-effect [see experimental Cosserat figure] is predicted in the torsion of circular cylinders and of square section bars of Cosserat elastic materials. Slender cylinders appear more stiff then expected classically. There is a sensitivity to strain gradient. A similar size effect is also predicted in the bending of plates and of beams. In experimental Cosserat elasticity, one uses these size effects to determine the characteristic lengths. No size effect is predicted in tension. (ii) The stress concentration factor for a circular hole, is smaller than the classical value. Small holes exhibit less stress concentration than larger ones. This gives rise to enhanced toughness. (iii) The wave speed of plane dilatational waves in an unbounded Cosserat elastic medium is independent of frequency as in the classical case. The speed of shear waves depends on frequency in a Cosserat solid. A new kind of wave associated with the micro- rotation is predicted to occur in Cosserat solids. (iv) The range in Poisson's ratio based on stability considerations for an object with free surfaces is from -1 to +0.5, the same as in the classical case. Osteon Article - Strong Cosserat effects seen in the torsion of bone. J. F. C. Yang and Roderic Lakes, "Transient study of couple stress in compact bone: torsion", Journal of Biomechanical Engineering, 103, 275-279, (1981). Lakes, R. S., "Dynamical study of couple stress effects in human compact bone", Journal of Biomechanical Engineering, 104, 6-11, (1982). Yang, J. F. C., and Lakes, R. S., "Experimental study of micropolar and couple stress elasticity in bone in bending", Journal of Biomechanics, 15, 91-98, (1982). International Journal of Engineering Science, 20 (10), 1161-1167, (1982). A solid which is isotropic with respect to coordinate rotations but not with respect to inversions is called noncentrosymmetric, acentric, hemitropic, or chiral. Chirality has no effect upon the classical elastic modulus tensor. In Cosserat elasticity, chirality (hemitropy) has an effect. A chiral Cosserat solid has three new elastic constants in addition to the six considered in the fully isotropic micropolar solid. The chiral micropolar solid is predicted to undergo torsional deformation when subjected to tensile load. Thus chiral solids have different mechanical behavior from solids with a center of symmetry, as allowed by the more general Cosserat elastic theory. Experimental stretch twist coupling was presented in R. S. Lakes, Is bone elastically noncentrosymmetric?, Proc. 34th ACEMB. Houston (1981). This is likely the first observation of elastic chirality in a material (in contrast to two ply strips). Get pdf. J. Materials Science, 18 2572-2581, (1983). Nakamura, S., Benedict, R. L. and Lakes, R. S., "Finite element method for orthotropic micropolar elasticity", International Journal of Engineering Science, 22 319-330 (1984). The total potential energy for a body composed of an anisotropic micropolar linear elastic material is developed and used to formulate a displacement type finite element method of analysis. As an example of this formulation triangular plane stress (and plane couple stress) elements are used to analyze several problems. The program is verified by computing the stress concentration factor around a hole in an isotropic micropolar material for which an exact analytical solution exists. Several anisotropic material cases are presented which demonstrate the dependence of the stress concentration factor on the micropolar material constants. Source code, Fortran, as text file. Typical input, input, and output files. No documentation can be provided other than comments already in the code. Lakes, R. S., "A pathological situation in micropolar elasticity, J. Applied Mechanics, 52 234-235 (1985). An experimental method is presented for the rapid evaluation of structured solids with microelastic degrees of freedom associated with the microstructure. By contrast with earlier methods based on size effect studies, the present method makes use of holographic interferometry. Results are presented for polymethyl methacrylate (PMMA) and for a dense polyurethane foam, which in previous studies were demonstrated to behave, respectively, as classical elastic and Cosserat solids. The method is based on study of deformation of a square cross section bar, in torsion, with a small crack at the corner. Get pdf. The image on the left shows holographic fringes for a PMMA bar in torsion. The notches at the cross section corner are indicated by yellow arrows. There is no displacement across either notch as indicated by the continuance of fringe order across the notch. This is as expected from classical elasticity. The image on the left shows holographic fringes for a dense polyurethane foam bar in torsion. 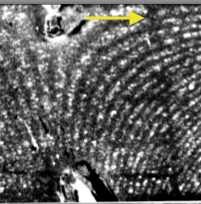 The notches at the cross section corner are indicated by yellow arrows. There is a displacement across each notch as indicated by the jump in fringe order across the notch. This is as expected from Cosserat elasticity. Lakes, R. S., "Demonstration of consequences of the continuum hypothesis", Mechanics Monograph, M5 1-5 (1985). Get pdf. The significance of several crucial assumptions within the theory of deformable bodies can be demonstrated via simple observations of motion of a crack in a bar of a structured material. The demonstration is based on a null experiment of a sort requiring no instrumentation. The demonstration is therefore ideally suited for the classroom environment. Consequences of the continuum hypothesis and its failure may be illustrated by means of a bar of flexible material, of square or rectangular cross section. Such a bar, if sufficiently large, is also useful for demonstrations of principal and anticlastic curvatures in bending, and warp of the cross sections in torsion. For the purposes of this article, consider two such bars, identical in size and shape. Let one be made of rubber and the other of polymeric foam such as that used as packing material. Consider a differential element at the corner of the bar. The surface traction upon the lateral surface is zero for torsional loading of the bar. By virtue of the symmetry of the stress tensor, the complementary shear stress must be zero. Since all components of the shear stress vanish at the corner, the shear strain must also vanish. By such arguments one can show that the cross sections of a rectangular bar in torsion must undergo warp: see, e.g. F.P. Beer and E.R. Johnston, Jr., Mechanics of Materials, McGraw Hill, New York, 1981. Consider, however, a similar micro-element in a material with a lattice type structure. The struts in the lattice can support a moment as well as a force, as shown in this diagram. The moment must be nonzero since the transverse struts undergo a twist. For the micro-element to be in equilibrium, a nonzero shear force must be transmitted through the longitudinal struts. Lakes, R. S., "Experimental microelasticity of two porous solids", International Journal of Solids and Structures, 22 55-63 (1986). Experiments are performed to determine the dependence of torsional and bending rigidity upon diameter for rod-shaped specimens of dense polyurethane foam and of syntactic foam. Results show an effect due to the microstructure. Size effects are observed in the linear regime of small strain. Results are describable by a Cosserat elastic model. All six Cosserat elastic constants are determined from experiment. Lakes, R. S. and Saha, S., "Cement line motion in bone," Science, 204, 501-503 (1979). Get pdf. Motion at the cement lines occurs in bone under prolonged load. Such motion is considered responsible for the long term creep in bone. The diagram at the right shows the interpretation of heterogeneous deformation in the context of Cosserat elasticity. 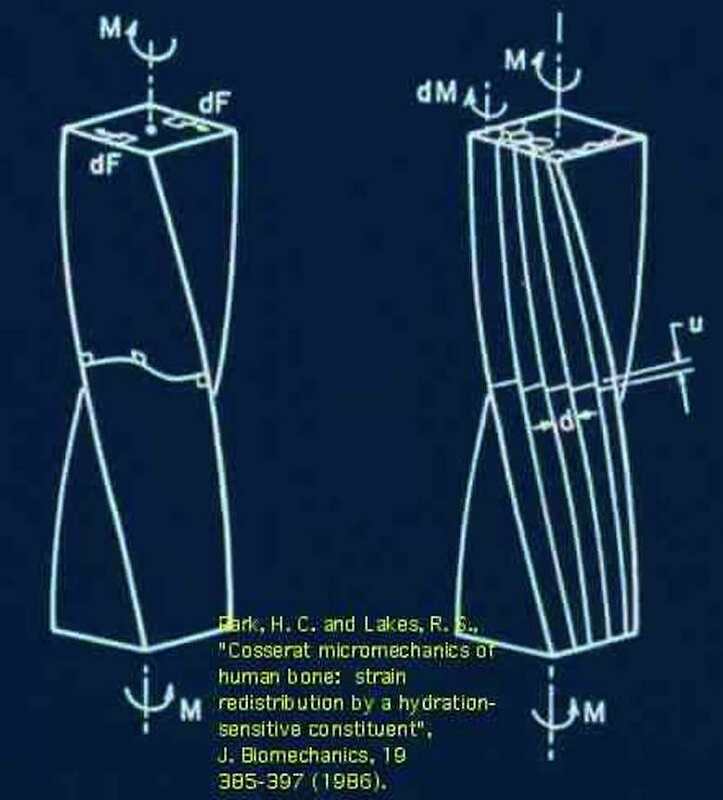 Park, H. C. and Lakes, R. S., "Cosserat micromechanics of human bone: strain redistribution by a hydration-sensitive constituent", J. Biomechanics, 19 385-397 (1986). The diagram at the right shows the interpretation of reduction of warp in the context of Cosserat elasticity. Experimental mechanics determination of the strain distribution in prismatic, square cross section bars of human compact bone in torsion disclosed nonclassical effects associated with the microstructure. Specifically, in wet bone at small strain, significant deviations from the classically predicted strain distribution were observed. The measured strain distribution in wet bone followed predictions based on Cosserat (micropolar) elasticity. Predictive power of Cosserat elasticity is illustrated by the fact the correct strain distribution is predicted assuming the characteristic lengths obtained from size effect studies. In dry bone, the strain distribution was very close to the prediction of classical elasticity. The interaction between Haversian osteons and the cement substance between them was hypothesized to be the principal mechanism for the phenomena. To evaluate this hypothesis, additional specimens were subjected to prolonged torsional load and the cement lines were observed by reflected light microscopy. 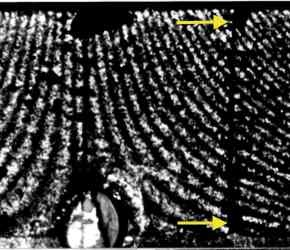 Localized deformation at the cement lines was observed, but it was less than values reported earlier for bovine plexiform bone. Get pdf. Park, H. C. and Lakes, R. S. "Torsion of a micropolar elastic prism of square cross section", Int. J. Solids, Structures, 23, 485-503 (1987). An analytical solution is presented for the problem of torsion of a prismatical bar of square cross section of a micropolar (Cosserat) elastic solid. Warp of the cross sections is found to differ from the warp in a classically elastic solid. Contrary to the classical case, a nonzero shear strain is predicted to occur at the edge of the bar. Novel experimental modalities are suggested on the basis of this analytical solution. The strain distribution across the lateral surfaces depends on the Cosserat characteristic length as shown in this diagram Download pdf. Lakes, R. S., "Negative Poisson's ratio materials", Science, 238 551 (1987). In the Cosserat model for structured solids, many phenomena are predicted and observed that depend on the material size scale in relation to the length scale associated with the deformation. A simple tension deformation (in an isotropic material) however is uniform and has no associated length scale. Consequently both the Cosserat model and classical elasticity predict the Poisson effect to be independent of scale. As for causes, structural aspects may be responsible both for Cosserat effects and negative Poisson's ratio. Get pdf or gif from here. Nakamura, S. and Lakes, R. S. "Finite element analysis of stress concentration around a blunt crack in a Cosserat elastic solid", Computer Methods in Applied Mechanics and Engineering, 66, 257-266 (1988). The problem of a blunt edge notch of elliptic contour in a strip of Cosserat (micropolar) elastic material under tension has been analyzed via two-dimensional (plane stress) finite element analysis. Both 3-node constant strain triangular elements and 4-node isoparametric elements were used. Three cases were explored: Cosserat characteristic length much less than the crack root radius, equal to the crack root radius; and comparable to the crack length. Stress concentration factors were found to be reduced by as much as a factor of 2.6 in comparison with a classically elastic material. For the special case of a classically elastic material, the finite element results agreed well with the classical analytic solution. Get pdf. Chen, C. P. and Lakes, R. S., "Dynamic wave dispersion and loss properties of conventional and negative Poisson's ratio polymeric cellular materials", Cellular Polymers, 8(5), 343-359 (1989). Lakes, R. S., Nakamura, S., Behiri, J. C. and Bonfield, W., "Fracture mechanics of bone with short cracks", Journal of Biomechanics, 23, 967-975 (1990). Tensile fracture experiments were performed upon specimens of wet mature bovine Haversian bone, with short, controlled notches. Stress concentration factors were found to be significantly less than values predicted using a maximum stress criterion in the theory of elasticity. Results were also modeled with the aid of linear elastic fracture mechanics. Agreement of experiment with theory was better in this case, however deviations were seen for short notches. Two mechanisms were evaluated for the behavior: plasticity near the crack tip, and effects of the Haversian microstructure, modelled by Cosserat elasticity, a generalized continuum theory. Plastic zone effects were found to be insignificant. Cosserat elasticity, by contrast, predicted stress concentration factors which better approximated observed values. To explore strain redistribution processes, further experiments were conducted upon notched specimens in torsion at small strain. They disclosed a strain redistribution effect consistent with Cosserat elasticity. These microelastic effects interpreted within a micropolar continuum model, are attributed to the Haversian architecture of bone. Get pdf. Lakes, R. S., "Experimental micro mechanics methods for conventional and negative Poisson's ratio cellular solids as Cosserat continua", J. Engineering Materials and Technology, 113, 148-155 (1991). A heavily twisted bar of negative Poisson's ratio foam exhibits minimal warp, in contrast to expectation of classical elasticity as shown in the image. Lakes, R. S., "Strongly Cosserat elastic lattice and foam materials for enhanced toughness", Cellular Polymers, 12, 17-30 (1993). Some foams exhibit size effects and other phenomena not describable by classical elasticity. These foams are describable by Cosserat elasticity, which is a continuum theory with more freedom than classical elasticity. Cosserat solids have a characteristic length which is greater than zero. Strongly Cosserat elastic materials are considered to be those materials for which the Cosserat characteristic length is substantially greater than the structure size and for which the coupling number is large. Such materials are predicted to exhibit superior toughness. A mechanically isotropic lattice model is presented for the study of foams. 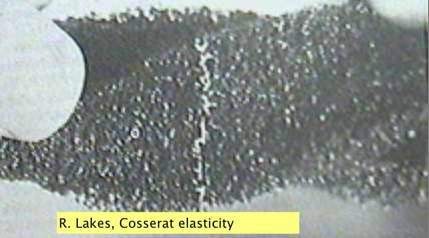 Ordinary open cell foams are shown to be weakly Cosserat elastic. If cell rib properties are modified, strongly Cosserat elastic effects can occur in the foam. Anisotropic laminate and fibrous materials can also be made to exhibit strongly Cosserat elastic effects. Chen, C. P. and Lakes, R. S., "Holographic study of non-affine deformation in copper foam with a negative Poisson's ratio -0.8", Scripta Metall et Mater., 29, 395-399, (1993). Anderson, W. B., Chen, C. P., and Lakes, R. S., "Experimental study of size effects and surface damage of polymethacrylimide closed-cell foam", Cellular Polymers, 13, 1-15 (1994). Anderson, W. B. and Lakes, R. S., "Size effects due to Cosserat elasticity and surface damage in closed-cell polymethacrylimide foam", Journal of Materials Science, 29, 6413-6419, (1994). Cellular solids are two phase composite materials in which one phase is solid and the other is a fluid, most often air. If the size scale becomes large enough, the material may no longer be assumed to be continuous. Some researchers have found that classical elasticity theory does not always adequately describe the behavior of cellular materials. In composite materials with stress concentrations due to holes or cracks, the observed fracture behavior is not correctly predicted by the classical theory of anisotropic elasticity. The experimental stress concentrations are consistently less than the theoretical ones . The non-classical fracture behavior has been dealt with using point stress and average stress criteria, however that approach cannot account for non-classical strain distributions in objects under small load. Strain distributions have been observed in fibrous composites and cellular solids which differ from the predictions of classical elasticity, particularly near small holes and small cracks. Observed concentrations of strain are less than predicted values. Strain fields around large holes, by contrast, follow classical predictions. A more general continuum theory such as Cosserat elasticity (micropolar continuum theory) or nonlocal elasticity, may be of use in predicting non-classical strain distributions. In this study, size effects in the mechanical rigidity of foams are examined experimentally. Analysis of the results is via generalized continuum mechanics and a model of surface damage. Lakes, R. S., "On the torsional properties of single osteons", J. Biomechanics, 28, 1409-1410, (1995). The high effective shear moduli of osteons that was observed by Ascenzi et. al. (1994) is interpreted in the context of size effects previously observed in bone. These phenomena are analyzed in the context of Cosserat elasticity. Lakes, R. S., "Experimental methods for study of Cosserat elastic solids and other generalized continua", in Continuum models for materials with micro-structure, ed. H. Mühlhaus, J. Wiley, N. Y. Ch. 1, p. 1-22, (1995). The behavior of solids can be represented by a variety of continuum theories. For example, Cosserat elasticity allows the points in the continuum to rotate as well as translate, and the continuum supports couple per unit area as well as force per unit area. We examine experimental methods for determining the six Cosserat elastic constants of an isotropic elastic solid, or the six Cosserat relaxation functions of a Cosserat viscoelastic solid. We also consider other generalized continuum theories (including micromorphic elasticity in which points rotate and deform, Cowin's void theory (theory of voids) in which the points dilate, and nonlocal elasticity). Ways of experimentally discriminating among various generalized continuum representations are presented. The applicability of Cosserat elasticity to cellular solids and fibrous composite materials is considered as is the application of related generalized continuum theories. Get pdf of this review article. Nakamura, S. and Lakes, R. S., "Finite element analysis of Saint Venant end effects in micropolar elastic solids", Engineering Computations, 12, 571-587, (1995). Prall, D. and Lakes, R. S., "Properties of a chiral honeycomb with a Poisson's ratio of -1", Int. J. of Mechanical Sciences, 39, 305-314, (1997). A theoretical and experimental investigation is conducted of a two-dimensionally chiral honeycomb. The honeycomb exhibits a Poisson's ratio of -1 for deformations in-plane. This Poisson's ratio is maintained over a significant range of strain, in contrast to the variation with strain seen in known negative Poisson's ratio materials. This is the first two-dimensional metamaterial that is chiral; we did not call it by such a name. Remark: these chiral honeycombs, also called chiral lattices, have been analyzed as Cosserat elastic solids. A. Spadoni, M. Ruzzene, Elasto-static micropolar behavior of a chiral auxetic lattice, Journal of the Mechanics and Physics of Solids, 60, 156-171 (2012). X. N. Liu, G. L. Huang, G. K. Hu, Chiral effect in plane isotropic micropolar elasticity and its application to chiral lattices, Journal of the Mechanics and Physics of Solids, 60, 1907-1921 (2012). Chiral materials are not invariant to inversions: there is a distinction between right and left handed material. Material properties such as piezoelectricity and pyroelectricity, represented by tensors of odd rank, can only occur in chiral materials. Chiral effects in elasticity cannot be expressed within classical elasticity since the modulus tensor, which is fourth rank, is unchanged under an inversion. We consider effects of chirality in elastic materials described by a generalized continuum representation, specifically Cosserat elasticity. Analysis of several configurations discloses a chiral material to generate reaction moments when compressed as a slab. A chiral plate bent to hyperbolic shape is predicted to exhibit size effects from the Cosserat characteristic length, and a shear force from the chirality. This analysis can be used for the interpretation of experiments on compliant chiral materials, in particular the evaluation of the elastic constants. Viscoelastic chiral solids are examined in the context of the correspondence principle. Download pdf . Lakes, R. S. and Drugan, W. J., "Bending of a Cosserat elastic bar of square cross section - theory and experiment", Journal of Applied Mechanics, 82(9), 091002 (2015). (8 pages). Pure bending experiments on prismatic bars of square cross-section composed of reticulated polymer foam exhibit deformation behavior not captured by classical elasticity theory. Sigmoidal deformation of the bars' lateral surfaces is observed. The surfaces are predicted by classical elasticity theory to tilt but remain planar upon application of pure moments to the ends. An approximate Cosserat three-dimensional solution to pure bending is obtained. This solution captures the experimentally-observed nonclassical deformation. preprint; journal reprint link. Rueger, Z. and Lakes, R. S., "Cosserat elasticity of negative Poisson's ratio foam: experiment", Smart Materials and Structures, 25 054004 (8pp) (2016). Negative Poisson's ratio polymer foams derived from reticulated open cell foams exhibit large size effects in torsion and bending. Effective moduli increase as diameter decreases in contrast to the prediction of classical elasticity. Size effects of this sort are predicted by Cosserat (micropolar) elasticity in which points can rotate as well as translate and distributed moments are incorporated. The Cosserat coupling number N was about twice as large as that of as-received foam, leading to strong effects. The torsion characteristic length was similar. Cosserat effects are known to enhance toughness and immunity from stress concentration. Rueger, Z. and Lakes, R. S., "Experimental Cosserat elasticity in open cell polymer foam", Philosophical Magazine, 96 (2), 93-111, January (2016). Reticulated open-cell polymer foams exhibit substantial size effects in torsion and bending: slender specimens are more rigid than anticipated via classical elasticity. Such size effects are predicted by Cosserat (micropolar) elasticity, which allows points to rotate as well as translate and incorporates distributed moments (couple stresses). The Cosserat characteristic length is larger than the cell size. The Cosserat coupling coefficient is larger than in dense closed-cell foams and approaches 1 for foam with 0.4 mm cells. Lakes, R. S., "Physical meaning of elastic constants in Cosserat, void, and microstretch elasticity", Journal of Mechanics of Materials and Structures, 11 (3), 217-229 (2016). The physical meaning of Cosserat, void, and microstretch elastic constants is analyzed and interpreted. Various torsion experiment designs provide a clear path to extract Cosserat elastic constants independently of any dilatation gradient sensitivity the material may have. For void elasticity (with sensitivity to dilatation gradients) there is no known quasistatic modality to demonstrate phenomena or extract elastic constants independently of any sensitivity to rotation gradients. Wave methods may be appropriate if there is minimal viscoelastic dispersion. Microstretch elasticity, which includes sensitivity to gradients of rotation and of dilatation could account for bending effects larger than those of Cosserat elasticity. Lakes, R. S., "Reduced warp in torsion of reticulated foam due to Cosserat elasticity: experiment", Zeitschrift fuer Angewandte Mathematik und Physik (ZAMP), 67(3), 1-6 (2016). Warp of cross sections of square section bars in torsion is reduced in Cosserat elasticity in comparison with classical elasticity. Warp is observed experimentally to be substantially reduced, by about a factor of four compared with classical elasticity, in an open cell polymer foam for which Cosserat elastic constants were previously determined. The observed warp in the foam is consistent with a prediction based on Cosserat elasticity. Concentration of strain in the foam is therefore reduced in comparison with classical elasticity. Strong Cosserat elastic effects are observed in a designed composite consisting of unidirectional corrugated tubes in a hexagonal array. The torsional characteristic length is much larger than the tube diameter. The effective coupling number N approaches its upper bound of 1. Extremely large size effects are observed, about a factor of 128 in torsion. Rueger, Z., Li, D., Lakes, R. S., "Observation of Cosserat elastic effects in a tetragonal negative Poisson's ratio lattice" Physica Status Solidi B, 254, (12), 1600840, 6 pages, Dec. (2017). Size effects are explored experimentally in a tetragonal lattice structure. Size dependence of rigidity is nonclassical elastic and is interpreted via Cosserat elasticity. The characteristic lengths are about a third the cell size. The size effect in torsion was a factor 4.5 in rigidity. The ratio of characteristic length to cell size is larger than in fully stretch dominated lattices but smaller than in bend dominated honeycombs or foams. Drugan, W. J. and Lakes, R. S., "Torsion of a Cosserat elastic bar with square cross section: theory and experiment", Zeitschrift fur angewandte Mathematik und Physik (ZAMP), 69(2), 24 pages (2018). An approximate analytical solution for the displacement and microrotation vector fields is derived for pure torsion of a prismatic bar with square cross section comprised of homogeneous, isotropic linear Cosserat elastic material. This is accomplished by analytical simplification coupled with use of the principle of minimum potential energy together with polynomial representations for the desired field components. Explicit approximate expressions are derived for cross section warp and for applied torque versus angle of twist of the bar. These show that torsional rigidity exceeds the classical elasticity value, the difference being larger for slender bars, and that cross section warp is less than the classical amount. Experimental measurements on two sets of 3D printed square cross section polymeric bars, each set having a different microstructure and four different cross section sizes, revealed size effects not captured by classical elasticity but consistent with the present analysis for physically sensible values of the Cosserat moduli. The warp can allow inference of Cosserat elastic constants independently of any sensitivity the material may have to dilatation gradients; warp also facilitates inference of Cosserat constants that are difficult to obtain via size effects. Lakes, R. S., "Stability of Cosserat solids: size effects, ellipticity and waves", Journal of mechanics of materials and structures (JoMMS), 13 (1) 83-91 (2018). We consider stability in Cosserat solids. To obtain restrictions on elastic constants based on positive definite strain energy, energy terms are tacitly assumed to be independent. In finite-size objects, however, the terms are linked in Cosserat materials. Therefore, in contrast to classical solids, the stability of Cosserat solids appears to depend on the size and shape of the specimen, provided strong ellipticity is satisfied. Stability in the presence of stored energy is possible. Solids with microstructure and stored energy offer the potential to facilitate attainment of extreme behavior in the presence of spatial gradients. Snap- through buckling in torsion is envisaged by analogy to the axial buckling concept used for composites with negative stiffness inclusions. It is possible to support compressive load in a stable manner but to dissipate energy in the presence of spatial gradients as in torsion or bending. 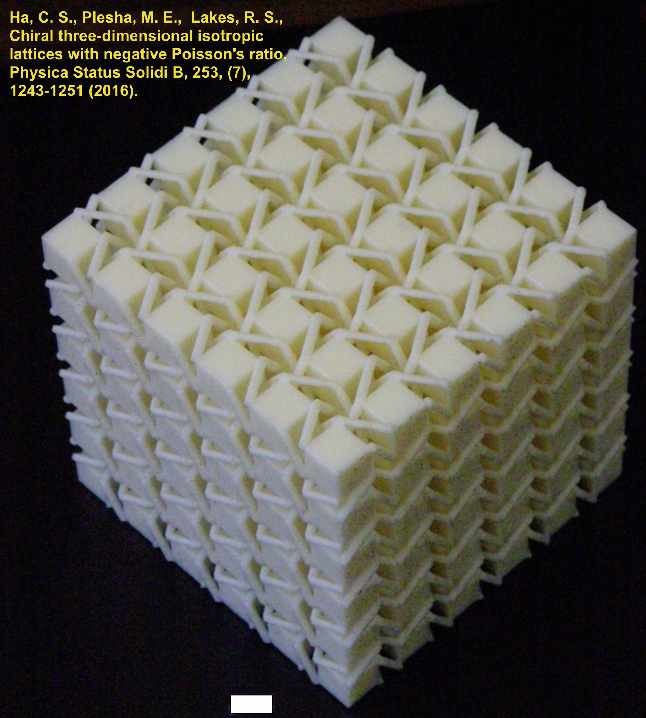 Andrade, C., Ha, C. S., Lakes, R. S., "Extreme Cosserat elastic cube structure with large magnitude of negative Poisson's ratio", Journal of mechanics of materials and structures (JoMMS), 13 (1) 93-101 (2018). A structure consisting of pivoting cubes is presented. It has zero Young's modulus and zero bulk modulus. Poisson's ratio has large negative values in all directions; the structure exhibits anisotropy in Poisson's ratio. The structure is compliant in tension but rigid in torsion and bending. The Cosserat characteristic length tends to infinity. Rueger, Z. and Lakes, R. S., "Strong Cosserat elasticity in a transversely isotropic polymer lattice", Physical Review Letters, 120, 065501 Feb. (2018). Large size effects are experimentally measured in lattices of triangular unit cells: about a factor of 36 in torsion rigidity and 29 in bending rigidity. This nonclassical phenomenon is consistent with Cosserat elasticity which allows for rotation of points and distributed moments in addition to the translation of points and force stress of classical elasticity. The Cosserat characteristic length for torsion is 9.4 mm; for bending it is 8.8 mm; these values are comparable to the cell size. Nonclassical effects are much stronger than in stretch dominated lattices with uniform straight ribs. The lattice structure provides a path to attainment of arbitrarily large effects. journal reprint link; get pdf. Some may call these metamaterials. Rueger, Z., Ha, C. S. and Lakes, R. S., "Flexible cube tilt lattice with anisotropic Cosserat effects and negative Poisson's ratio" Physica Status Solidi B, 256, 1800512 (2019). A 3D lattice structure consisting of pivoting cubes with flexible links at the corners is presented. It exhibits anisotropic negative Poisson's ratio -0.54 and -0.75. Size effects occur in torsion and bending; these effects are consistent with Cosserat elasticity but not with classical elasticity. Cosserat elastic solids exhibit sensitivity to strain gradients; size effects occur in torsion and bending; also reduction in stress concentrations. The Cosserat effects also reveal anisotropy. A dense closed cell foam is studied to determine which continuum theory of elasticity is applicable. Size effects inconsistent with classical elasticity are observed. The material exhibits a characteristic length scale considerably larger, by more than a factor 6, than the largest observable structure size. The Cosserat coupling number N is shown to be small, via measurements of size effects in square section bars, comparison with size effects in round section bars, and determination of warp of a square section bar in torsion. For this material, the couple stress theory is excluded and the modified couple stress theory is excluded. Theories that force constants to their thermodynamic limits do not apply to this foam. The role of other generalized continuum theories is considered. Recent research involves experimental study of Cosserat elastic effects in open cell foams and of analysis of microstretch elasticity which contains Cosserat type freedom as well as sensitivity to dilatation gradient. Sensitivity to dilatation gradient cannot account for the effects observed in torsion, in which there is no dilatation. Cosserat effects are observed in negative Poisson's ratio foams. Designed Cosserat lattices have been embodied physically via 3D printing and studied experimentally. Tuning of Cosserat constants is possible. It is therefore possible to control asymmetric stress in materials. For an interpretation of generalized continuum properties, see P. Neff site. As for other experiments, waves have been recently used by Merkel, Tournat, Gusev "Experimental evidence of rotational elastic waves in a granular phononic crystal". The system they used is an assembly of elastic spheres in contact. This is an ideal system, designed to exhibit only one Cosserat constant. Wave methods for Cosserat and other generalized continua are suitable for idealized elastic systems without dissipation as discussed in more detail in the linked page. For dissipative materials or systems, wave speed varies with frequency from both viscoelastic effects and dispersion from the microstructure. This complicates interpretation. We have never used the term metamaterials for designed Cosserat solids, though such terminology has recently become popular in referring to materials that attain interesting or extreme properties via structure rather than composition. Similarly we did not use the phrase materials by design or architectured materials or architected materials.